We start our tour of the top things to do in Lodi with the World of Wonders Science Museum. With a mission to offer hands-on, science-based exhibits and programs to stimulate discovery for all ages, the WoW as it’s affectionately known by locals, is home to over 70 hands on science exhibits and plenty of incredible events throughout the year! Even more exciting is its continued growth as plans are already in the works to expand the museum through the WOW Science Plaza project in the coming years. TripAdvisor User @tuf_travelers out of the Bay Area calls this an “Electrifying fun place”, saying it was fun for all ages and that the museum is a good size, not too overwhelming for little ones. "Highly recommend and will go back”. Home to native and exotic animals from all over the world, the five-acre, Micke Grove Zoo works to not only help in conservation of endangered animals, but also works to educate and entertain visitors through their vast knowledge and array of programs. From invertebrates like the Madagascar Hissing Cockroach, to reptiles like the Radiated Tortoise, Birds like the Golden Eagle and mammals like the Tamarin’s, Lemurs and Snow Leopard, there are plenty to see and learn about! Residents of Lodi in the fall and winter, viewing the Sandhill Cranes is a must for any and all birdwatchers. The birds make a very unique noise, and their vast numbers during their migration make for an experience like none other. When in season, the popular destination to view these birds is known as the Woodbridge Ecological Reserve, aka the Isenberg Crane Reserve. Take a self-guided tour, or book a tour through the California Department of Fish & Wildlife with local docents who will take you to a private part of the reserve for a closer look! Spanning across three vineyards totaling 85 acres, the Berghold Family began producing handcrafted wines in 1999. Today, the winery is an incredible place to visit in Lodi. Not only do they produce some amazing varieties of wine like Syrah, Cabernet Sauvignon, Merlot and more, but their tasting room is extremely unique! Owners Joe and Kay have collected antiques from the American Victorian period which makes for a memorable experience. But perhaps it’s their “music box”, which is more like an orchestral cabinet that makes this tasting room a popular and one-of-a-kind destination! A property spanning across 320 acres not only includes some of the oldest producing vines in the Lodi Appellation, but also some spectacular, barnyard scenes! Their rustic tasting room and patio is surrounded by the vines, their ranch and farm animals that give you the feeling you are worlds away, despite being moments away from the city. The eighth oldest winery in Lodi is a perfect stop for great wine, and amazing scenery! Just moments away from downtown Lodi, Harney Lane Winery is a beautiful open tasting room complete with a natural, outdoor oasis to enjoy some handcrafted wines. Whether you enjoy a glass with a loved one outside, soaking up the sounds of birds chirping and the feel of the warm sun on your skin, or prefer to chat with their friendly staff in the tasting room, you’re sure to enjoy your time, and wine, at Harney Lane! With a motto like love, laughter and family it’s no wonder why Trip Advisor Users love this winery, not just for the care they put in their wines, but for the kinship and comradery! Whether it’s a picnic, a family walk or bike ride along the nature trails, or a jaunt in the lake on paddleboards or kayaks, Lodi Lake Park is an amazing spot to spend time at in the city. Be inspired by the wildlife, otters, deer and birds or, visit the Headwaters Boat House where you can rent a personal watercraft, or even enjoy one of their number of tours that vary from a moonlit paddle on the water, a paddle for ladies only or even special holiday themed paddles! While the Phillips family have been farming since the 1850’s it wasn’t until fifth generation grape growing brothers, Michael and David, that their unconventional and unique approach to wine began taking over the world! As they say, they don’t break the rules, they make them, and with their collection of unique wine brands like Freakshow and Petite Petit became internationally known. To make things even more exciting for the winery, winemaker Adam Mettler was named Wine Enthusiast’s 2018 Winemaker of the Year, ensuring their winery as one of the hottest spots to visit when you come to Lodi! Through the years, the Lodi Appellation has impressed the world’s wine connoisseurs, including the prestigious honor of being named Wine Enthusiast’s Wine Region of the Year in 2015. With 85+ wineries within the region, it can get overwhelming as to which ones to visit during your trip! What’s amazing about the Lodi Wine & Visitor’s Center is that they offer tastings across the appellation that change weekly. It’s a great way to taste across the appellation, learn about the various wineries in the region, pick up customized recommendations based on the wines you enjoy and even purchase wines from a number of local producers, all in a “one-stop-shop”. Now in their six generation of producing some of the finest wines in the city, Klinker Brick Winery is named after the highly prized bricks that are used in their winery and other older buildings. Not only are the bricks unique, but also dark and rich in color, a perfect metaphor for the rich, unique and distinctive features of the wines produced here. Their tasting room provides another rustic experience, and is perfect on a nice day! Their goal is to produce world class wine, and TripAdvisor users agree, a stop at the winery is an absolute must for any getaway to Lodi. 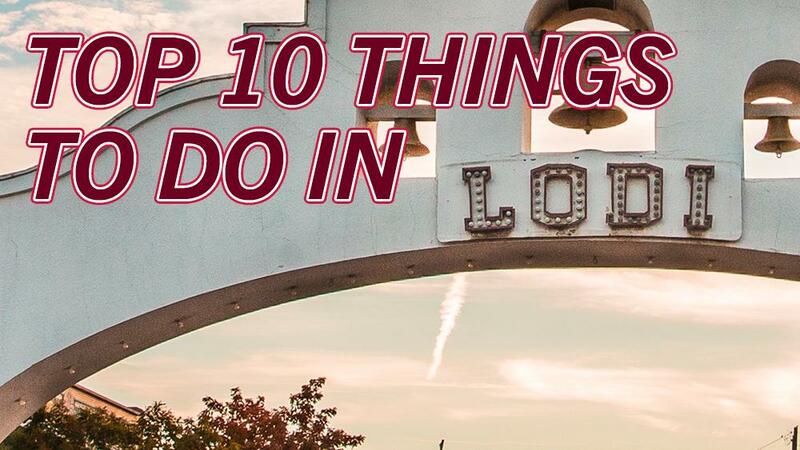 And there you have the Top 10 Things to do in Lodi according to TripAdvisor users! Be sure to head to sites like TripAdvisor to let other prospective visitors what you enjoyed in Lodi! Start planning your visit to Lodi now and be sure to check out these, and other, fantastic Lodi businesses and create memories that last a lifetime! Click here for your FREE visitor’s guide, and don’t forget to follow us on Facebook, Instagram and Twitter @VisitLodi.